Description: 맑음[mal:gem] — the Korean word for cleanness, clarity and pureness. Skin Malgeum hypoallergenic toners promote clean, clear and pure complexion with moisturizing and pore cleansing formulas. *Fresh: Controls excess sebum while providing enough moisture to keep the skin matte. Bamboo extract and sebum control ingredient keeps the skin clean and fresh. Directions: Dispense solution onto toner pad and use pad to wipe all areas of face and neck. The toner comes in a matte bottle with a plastic twist-off screwed cap and the opening is perfectly sealed with a foil. 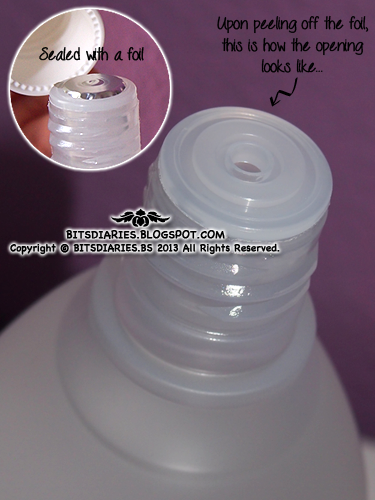 The fluid can be easily pour out from the opening of the bottle. I usually moisten a cotton pad and gently swipe it all over my face. It gets absorbed into the skin after a few minutes without leaving any sticky residue. It smells citrusy when sniff directly from the opening of the bottle. But when pour it out on hand and sniff it, there's a mild hint of floral scent to it. I might be wrong though... lol. I'm bad at describing scent. hah. :x It does not smells bad anyway. It DOES control sebum but of course, not to the extend that you will be totally free from oiliness the whole entire day. My skin still feels oily throughout the day and I still need to blot my face with oil blotters however, I noticed that the amount of sebum has been significantly reduced compared to what I would normally get. 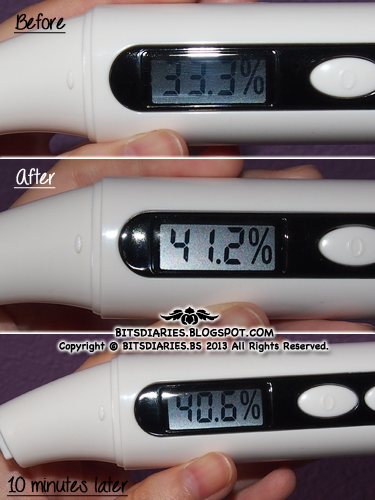 After applying the toner, my skin moisture level measured 41.2%. The difference on moisture loss after 10 minutes was only 0.6%. which I concluded that this toner is pretty moisturizing. With application of a moisturizer, I believe the skin will be perfectly moisturized! Verdict? : I have already finished using this toner and it does works as what it claimed to do — "controls sebum yet at the same time provides moisture to the skin". It leaves the skin feeling clean, fresh and cooling upon application. On the downside, I don't think it helps minimizing the pores though...I didn't see a difference in the size of my pores. Anyway, this toner is perfect for Summer season, for people who live in hot and humid country and also for people who have oily skin. Hi! Thanks for sharing this! ^_^ I've been wanting to try this for so long but haven't got the chance! From your review I can see that this is a good product especially the pore cleansing and control the sebum part. Well, glad this works on your skin.